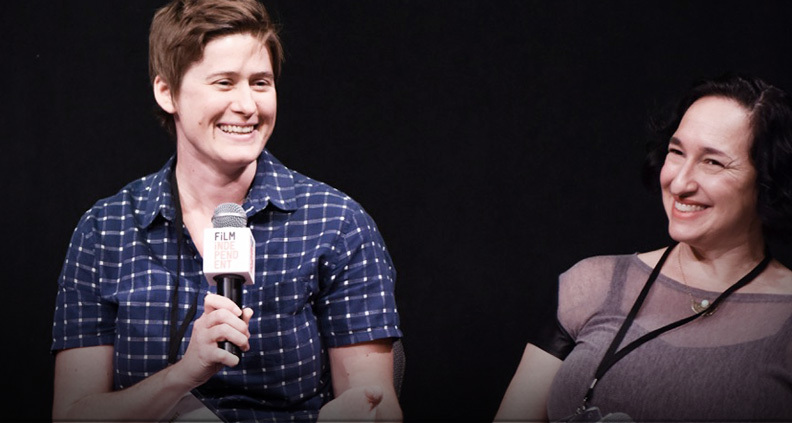 The teams consisted of Experimenter producers Aimee Schoof and Isen Robbins and from Operator, writer/director Logan Kibens and writer/producer Sharon Greene. Experimenter is a biopic about the life and work of psychologist Stanley Milgram, a Yale researcher who studied how people respond to authority figures—particularly when what they’re told to do contradicts their own instincts. Raising tough moral questions about the implications of such research, the story had to be faced with courage and honesty, and was a story producing partners Schoof and Robbins felt must be told. “In 20 years of making films together, this is probably our favorite,” declared Schoof. Directed by Michael Almereyda and starring Peter Sarsgaard as Milgram, Experimenter was released in 2015 and is now available to stream on Netflix. Operator is a comedic drama about a young programmer (Martin Starr) on the search for a physical voice with which to endow a new digital customer service agent he’s designing. He finds the perfect voice in his wife, Emily (Mae Whitman), who works at a hotel reception desk and seems to have the perfect combination of empathy, engagement and professionalism. Tensions develop between the couple as Starr’s Joe becomes attached to the digital interface. Inspired by IRL instances of Amtrak customers calling to speak to digital sales agent “Julie” without ever making a purchase, co-writers Kibens and Greene spent five years developing the project before finding an investor. Operator premiered at SXSW was released on VOD in 2016. Sharing similar themes to 2013’s Her, the Operator team found the Spike Jonze film’s success to be helpful to their pitch. Instead of trying to make the case for their story in a vacuum, they now had demonstrable evidence that such material would be resonant with audiences. 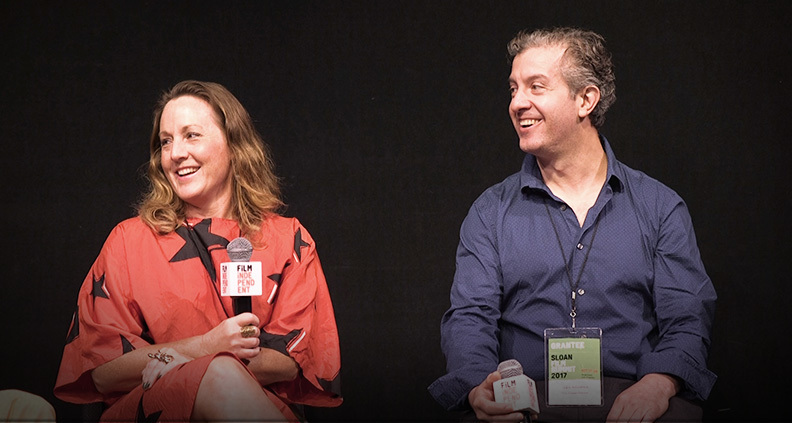 While pitching to 20 producers a day for three days during Fast Track at the 2014 LA Film Festival, Operator eventually made the connection that led to its sole financier—a tech sector businessman who ponied up half the film’s $1.2 million budget. Greene agreed with the difficulty of generating finances, recalling her first producer meetings with her collaborator and wife, Kibens. New to Hollywood, they had a number of very positive meetings where everyone involved seemed excited, only to end with some variation of: “Great, call us when something actually happens!” Greene felt like even though everyone was speaking English, she and Kibens still had no idea what was being said to them. Schoof pointed out that first money is the hardest to raise—Everyone wants to hop on a train that’s already moving, but no one wants to go first. Which prompted a comment from the front row as Doron Weber, Vice President of Programs and Program Director at the Alfred P. Sloan Foundation, shouted, “We go first!” prompting cheers and applause from the auditorium. 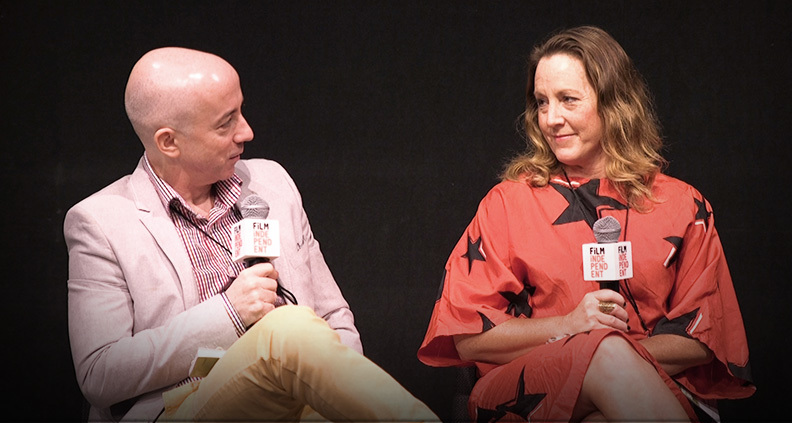 What did each of these filmmakers get from the Alfred P. Sloan Foundation, and what opportunities did this create for them? For Experimenter, director Daniel Almereyda had previously applied for—and won—a $20,000 Sloan Lab Fellowship through the Sundance Institute and a $20,000 Sloan Film Production grant through the Tribeca Film Institute. But the biggest prize was yet to come, as Schoof and Robbins achieved their ideal ending: landing distribution. With the $50,000 Sloan Distribution Grant awarded through Film Independent, Schoof and Robbins were able to be proactive with their marketing and distribution, raising general awareness of Stanley Milgram’s life and work and finding their eventual niche audience. “Get your social media going from the very, very beginning,” Schoof recommended. “These things people were saying: momentum, buzz, heat… We were, like, ‘What do those words mean?’” mused Kibens. Then she figured it out: the first thing they needed was money, an initial investment that puts the wheels in motion. For Operator, a big chunk of the $20,000 Alfred P. Sloan Producers Grant that they received through Fast Track went to hiring a casting director who could bring in the on-screen talent that would ensure their funding. “Our investor needed a high-profile cast attachment,” said Greene. So the grant money created an opportunity with casting, which landed the opportunity with the investor. What’s more, Kibens had previously received a $15,000 Lab Fellowship prize from Sloan through the Sundance Institute, $5,000 of which was earmarked for a technical science advisor to guide the film’s verisimilitude in its depiction of engineering and AI. As Robbins put it, “It’s not over until you quit.” To read our full Operator case study, click here. To read our full Experimenter case study, click here. The 2017 Sloan Film Summit is taking place October 27-29 at the Japanese American National Museum in Downtown Los Angeles. For more information about the Alfred P. Sloan Foundation, visit sloan.org. To see a full schedule of events, including speaker and panelist info for the 2017 Sloan Film Summit, click here.